Could they be any more different? They're totally Out of Their Element! Four full-length novels in this collection where mismatched couples find unexpected romance. 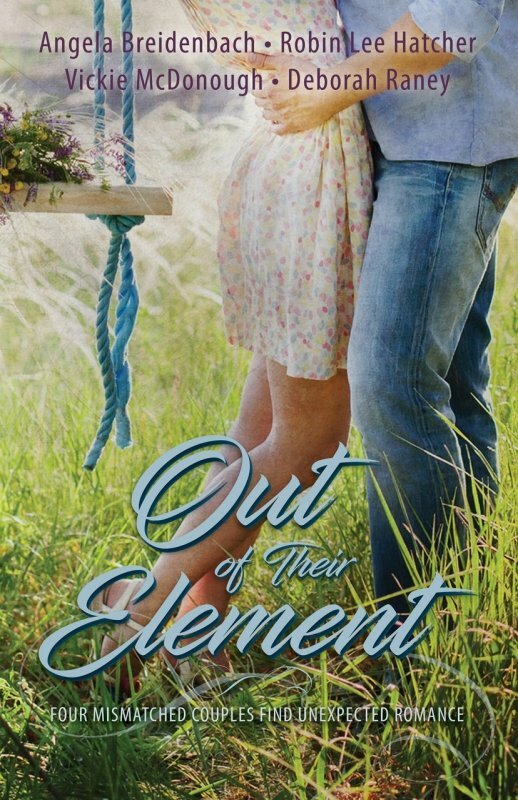 Out of Their Element: Four Mismatched Couples Find Unexpected Romance a collection of contemporary romance novels by Angela Breidenbach, Robin Lee Hatcher, Vickie McDonough, and Deborah Raney. Four full-length novels by four award-winning authors. They're totally Out of Their Element! Now what? A computer geek is completely out of his element in the wilds of Wyoming. Despite a pressing deadline, Evan accompanies his niece on a two-week wagon train tour with her history class. The pretty gal heading up the tour thinks he’s a total greenhorn. When the tour is sabotaged, will Evan’s skills help solve the mystery? Michelle Penn has dropped out of college to work as a reporter for a tiny weekly newspaper. The boss's handsome son, Robert Merrick III, is quickly making her forget all about her former sweetheart, but Rob is forbidden by office policy to date Michelle and his father is standing firm on policy. It seems they need a small miracle to be able to keep all the promises they’ve made—to themselves and to each other. 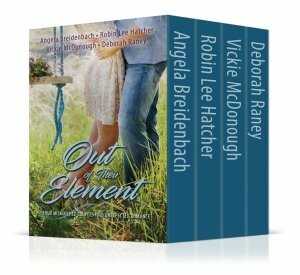 Out of Their Element: Four full-length novels from four award-winning authors: Angela Breidenbach, Robin Lee Hatcher, Vickie McDonough, and Deborah Raney. Determined to escape her grandmother’s broken-down ranch as soon as she can, Karen Butler resists connecting with its inhabitants – especially Dusty Stoddard, the driven director of the Golden T’s summer camp for at-risk youth. But by the time she discovers she’s not the only one who has been wounded, it is too late to escape; they have become a part of her healing and she a part of theirs. A computer geek is completely out of his element in the wilds of Wyoming. Despite a pressing deadline, he’s accompanying his niece on a two-week wagon train tour with her history class. The pretty gal heading up the tour thinks he’s a total greenhorn, but he can’t help his attraction to her. When the tour is sabotaged, will Evan’s skills help solve the mystery? Michelle Penn has dropped out of college to work as a reporter for a tiny weekly newspaper. The boss’s handsome son, Robert Merrick III, is quickly making her forget all about her former sweetheart, but Rob is forbidden by office policy to date Michelle and his father is standing firm on policy. It seems they need a small miracle to be able to keep all the promises they’ve made—to themselves and to each other.